Sometimes the only way to believe in forever is to see it firsthand. ﻿﻿I read this quote in a magazine ad on the wild and wonderful charms of West Virginia, a state I've never visited. It reminded me of another wild and wonderful sight from my travels. At the end of the Taft Point Trail in Yosemite National Park is a spot that perfectly fits the quote: You can see forever. 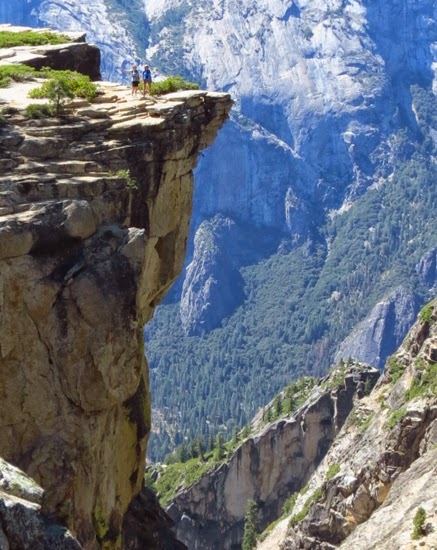 In fact, you’ll have heart-thumping views of the Yosemite Valley 3000 feet below while roaming among huge granite boulders overlooking sheer drop-offs. 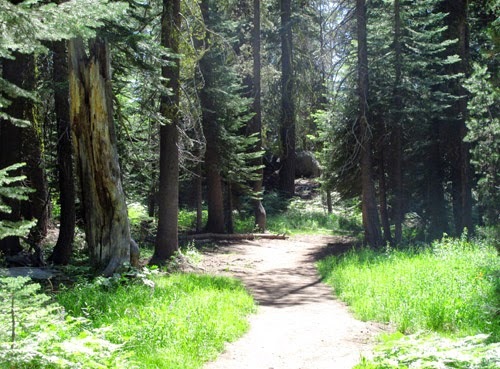 The hike starts out on a forested path. This 2.2-mile round-trip hike starts from the same trailhead as Sentinel Dome Trail on Glacier Point Road. 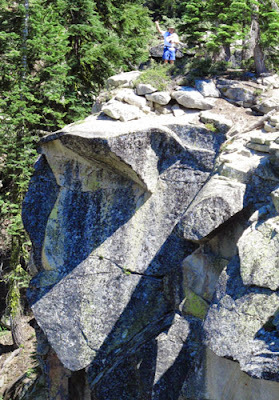 It meanders in the opposite direction through a thick green forest (shady and cool despite warm afternoon temperatures) and briefly climbs up a granite rock face to the top of Taft Point's cliff. visitors back from the edge. From about 8,000 feet elevation you have sweeping vistas of the Valley, ElCapitan, and Yosemite's north rim. But what is most striking is the incredible sense of awe you feel at the vastness stretching out in front of and below you. With a strong wind blowing--and only one small guardrail--you also need a healthy respect for the potential danger of the site. In fact, a couple fell to their deaths from this spot in October 2018. 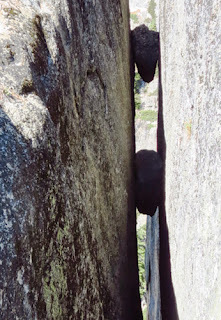 Among the features of this hike are the fissures or cracks created by centuries of geologic upheaval--some trapping huge boulders between the rock walls—just waiting for an earthquake to shake them loose. Amazingly, our party of three had this entire scene to ourselves. We wandered over the rock surface, and I tempted the fates a bit bydangling my feet over the edge (I looked out not down!). We lingered awhile on elevated rocks just soaking in the serenity and peacefulness of this immense, isolated spot. Even in a national park visited by four million people annually, it’s possible to feel alone and at one with nature. at Taft Point in Yosemite. 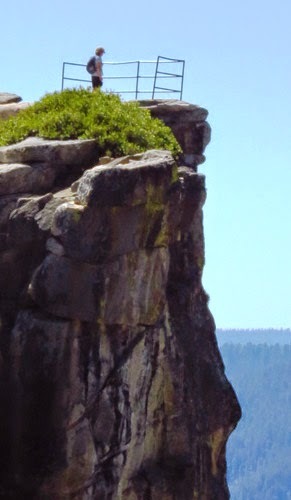 Taft Point Trail isn’t a difficult hike; but if you take children, be sure to keep an eye on them at the top! There’s plenty of room to roam, which is fine as long as they don’t lose their footing or get close to the edge.